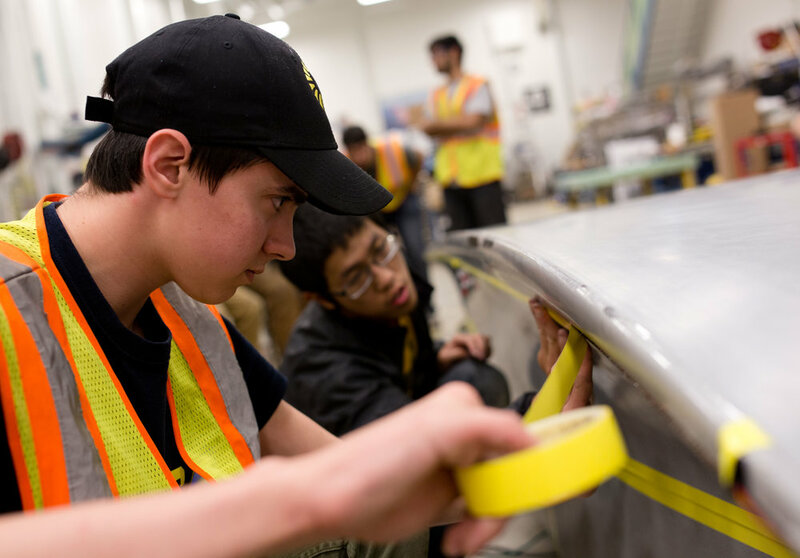 The University of Michigan Solar Car Team and 3M share a close partnership. 3M provides Michigan with a vast array of products that aid the team with everything from team safety to structural support and aerodynamics. 3M keeps our team members safe while working on the car with such products as respirators, which prevents them from inhaling substances that can hurt the lungs, such as carbon dust or tooling board dust. 3M provides Personal Protection Equipment, as well; while working on the car or on the team’s semi, team members sport 3M full-body suits. The team extensively uses other safety fundamentals, like 3M electrical tape and heat shrink, which insulate wires, adding protection. All of these contributions by 3M were vital for team well-being during solar car Aurum’s build cycle. UM Solar Car team member dons 3M protective full-body suit and respirator. Aurum won the University of Michigan its ninth overall American Solar Challenge title, and 3M products keep it structurally sound. Aurum is held together by 3M adhesives. DP 100, DP 105, DP 420, DP 460, VHB—these are all very strong adhesives that play key roles in Aurum’s make-up. For example, the glue DP 460 bonds the car’s chassis, its basic frame, to the lower portion of its body. VHB (Very High Bond) tape holds Aurum’s solar array to the upper. The team also uses 3M’s 471 vinyl tape to tape the car’s seams together, to tape the fairings to the body of the car, and to tape the upper to the lower. During every charging period of the 2016 ASC—every morning, every night, at every checkpoint, and at every Stage stop—Michigan’s race crew un-taped and re-taped the car. The team uses 471 vinyl for this because it is effective, lightweight and easy to both remove and replace. This facilitates the charging process, which involves detaching the upper from the lower and angling it so that the array points towards the sun. The team applies 3M 471 vinyl tape to Aurum. 471 vinyl tape also has aerodynamic merit; by covering the car’s seams, it helps with minimizing drag, thus maximizing aerodynamics. 3M helps Michigan create the most aerodynamic vehicle possible with sanding materials as well, like sandpaper and orbital sanders. Michigan uses these tools to make the car’s surface smoother. This makes the car more aerodynamic, which, in turn, means it consumes less power. Aurum’s aerodynamic body was a huge reason it won the 2016 ASC as the only car to finish solely on solar power—3M had a hand in reaching that aerodynamic standard. After the race, 3M hosted the UM Solar Car Team at its headquarters in St. Paul, Minnesota. While visiting, the team gave a presentation on how the ASC had gone and how we used 3M products to build Aurum. UM Solar’s 2016 ASC Race Crew at 3M headquarters in St. Paul, Minnesota. Members of 3M’s team gave UM Solar a tour of the 3M Innovation Center and showed us many exciting products they had invented like reflective films. 3M also presented the team with more 3M products that the team could use in the upcoming build cycle for the 2017 World Solar Challenge. We look forward to working with 3M on incorporating some of these technologies into our 2017 car and on furthering our partnership. In 2014, Aurum was built with 3M. In 2016, Aurum crossed the ASC finish line held together—quite literally—by 3M. Now, in 2017, we look forward to working with 3M on our new car. Thank you, 3M. 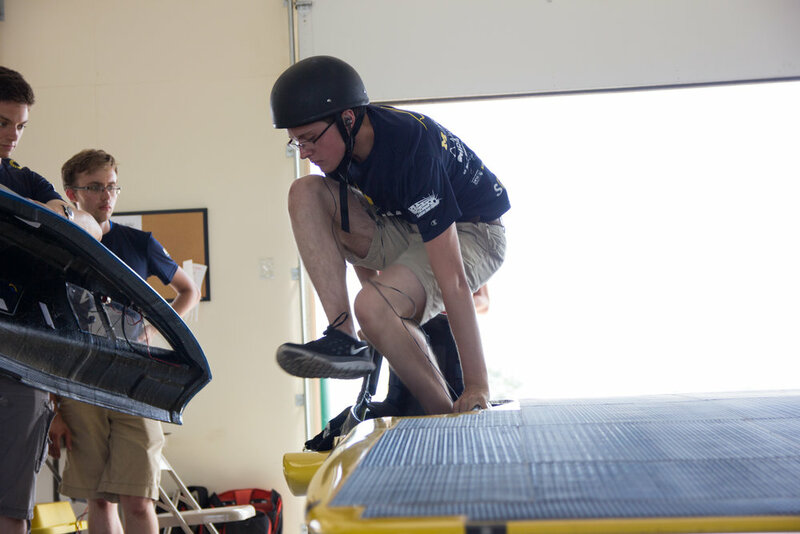 For over 12 years, Altair has sponsored the University of Michigan Solar Car Team, and its HyperWorks products enable the team to develop the lightest, safest, strongest solar vehicles possible. Altair is among the most supportive of our sponsors, granting the team unlimited access to its software suite of tools and educational resources. Any individual on the team can take advantage of this valuable resource. The main tools UM Solar utilizes include HyperMesh, HyperView, and OptiStruct. Having this software at the team’s disposal was crucial when designing Aurum, the car that won Michigan its sixth consecutive American Solar Challenge title this past summer. With HyperWorks, the team’s engineers analyze composites, create ply schedules in CAD, and apply forces to the car to visualize what parts of it are put under stress or strain; in essence, HyperWorks enables Michigan’s engineers to determine that the parts they design will not fail under certain conditions. Michigan analyzed the roll cage, for example, for rollover conditions. Michigan took a risk with the roll cage; the team had never built a carbon fiber roll cage before, but we were determined to have Aurum sport one. A carbon fiber roll cage would yield significant aerodynamic gains by reducing the frontal area of the canopy, greatly increasing speed. Since the carbon fiber roll cage was a first and thus a risk, the team had to be absolutely certain the roll cage would not fail. HyperWorks gave Michigan that degree of certainty, providing it the best platform with which to do something it had never done before. Altair’s influence during this design process extends further than its HyperWorks software. The company also supported Michigan with training and access to local application specialists for technical support. And Altair’s willingness to help the team explore other software tools yielded quicker, more accurate solutions. In the 2015 design phase, HyperWorks made it possible for UM Solar to build a competitive car, Aurum. In 2016, HyperWorks made it possible for UM Solar to adjust Aurum’s specifications to meet ASC regulations while remaining a formidable, competitive car. When Aurum was first built, it met all the regulations for the 2015 World Solar Challenge, but the 2016 American Solar Challenge had its own set of regulations, and there wasn’t always overlap; in order to even compete in the race it would later win, Aurum had to first undergo some reconfigurations. It was crucial that Michigan not compromise Aurum’s effective design while making these necessary reconfigurations, and HyperWorks made that possible. ASC safety regulations called for the addition of a crush zone six inches out on the driver’s side, so UM Solar designed a crush zone “wing” that complied with the regulations while minimizing aerodynamic setbacks. As UM Solar geared up to compete in the ASC, its engineers also used HyperWorks to revisit Aurum’s suspension models and analyze its chassis for side impact and front collision. Since Altair’s software helped the team ensure its car was safe, robust, and met all regulations, Michigan was able to finish the scrutineering, or inspection, phase of the race first. This set the team up for success, because it consequently started the qualifying track race from pole position. Altair’s software, trainings, and technical specialists helped make Aurum the formidable solar vehicle it is. Thank you, Altair. Since the early years of the University of Michigan Solar Car Team’s pursuit, GM has been one of our most committed supporters. The team’s close partnership with GM enabled its historic victory in the 2016 American Solar Challenge. GM supplied us with two long-term vehicles to utilize while racing, contributing to our caravan the Weather and Media vehicles, two cars that played key roles during the 2016 ASC. The team’s caravan supports solar car Aurum during the race, ensuring as smooth a ride as possible. Different race crew tasks are compartmentalized within different caravan vehicles in order to maximize efficiency and make things run as seamlessly as possible for the driver in Aurum. The Weather vehicle is one of the most important pieces of the caravan, driving 30-45 minutes ahead of the solar car and relaying relevant information back to the team’s strategists in the Chase vehicle, keeping them aware of conditions like cloud cover or the severity of a storm along the route that the team’s weather models anticipated. At the end of each day, the strategists in Chase send Weather a range of possible locations, and Weather scopes out a location ideal for charging. And when that End of Day location is decided on, Weather readies the area for Aurum’s arrival. Meanwhile, the Media vehicle allows the team to keep up a media presence, documenting the race through photography, videography, social media updates, and press materials. Media also has more flexibility than the other caravan vehicles, so it can travel ahead of or behind the main caravan, which affords it the opportunity to do some of the same scouting as Weather if the situation calls for it. The Media car also pulls into the End of Day location before Aurum; there, Media aids in setting up the space for the car, in flagging it into the allotted spot, and in removing the car’s canopy. And since Media carries the sprayer, it also helps with cooling the array for charge time. Having GM’s dependable vehicles in our caravan benefits the team immensely, because it gives assurance when performing key duties. GM also granted Michigan access to its Global Battery Systems Lab. Here, the team’s engineers built Aurum’s battery in an environment with the relevant safety measures, oversight, and equipment they needed to do so successfully. The state of the art equipment allowed Michigan to build the best battery it could. The EV battery welding system, for example, allowed for effective copper tabbing. Copper tabbing involves the welding of copper to the battery for the purpose of bolstering electric current, and improper execution of this welding introduces a greater chance of experiencing voltage drops. This would be detrimental during a solar race, when the car’s battery has to be as reliable as possible in order to make up for the unreliability of the energy source, the sun. GM’s equipment was precise and sophisticated enough for Michigan to create a battery pack that was light but did not sacrifice capacity. In a race with little sun and therefore less chance to charge, having a strong battery pack paid off, allowing greater storage of power. Thank you, GM. The team appreciates all you’ve done for us. Together, IBM and the University of Michigan Solar Car Team push the boundaries of what is possible. IBM’s technology informs Michigan’s Strategy Division in the realms of data-driven forecasting and optimization. This partnership yields more effective real-time decision-making based on accurate predictions. The end result? A faster, more energy-efficient race. In a solar race, solar energy intake is crucial. It dictates a large part of race strategy, affecting everything from speed to charging locations. When you depend on the sun for fuel, anything that gets between the solar array and the sun is a serious threat. Think of a sports car: no matter how sleek or well-designed a sports car is, if it can’t get to the gas station, it will never drive. For solar cars, weather poses that threat, so UM Solar’s strategy depends heavily on reading weather and reacting accordingly. That’s why IBM’s support is so important to the team. IBM’s contribution was particularly notable during the 2016 American Solar Challenge, a solar race largely characterized by rain and clouds, rather than actual sun. On the third day of the ASC, Michigan’s radar showed something threatening up ahead on the race route: a California-sized mass of clouds. Michigan found itself on the very edge of another storm, too, a fast-approaching one filled with thunder and lightning. The team could not risk having solar car Aurum get caught up in a storm like this; not only was it dangerous, it would mean slowing down and less access to solar energy, which would add hours onto the team’s lapsed time. Strategy had to take quick, decisive action. It had to determine when and how much to speed up in order to escape the storm. That’s where IBM comes in. IBM’s machine learning algorithms consolidate data from multiple sources—local weather stations, the team’s pyranometer, sensor networks, satellite observations, and more—into one coherent and readable 2D interface. The synthesis of all this data—data concerning cloud count and height, wind speed and direction, sun position, and weather event forecasts—provides Strategy with the clear picture it needs of both current and projected future solar radiation intake. This comprehensive view drives effective decision-making that cuts precious time from the team’s route. When faced with that threatening storm on race Day 3, Strategy consulted IBM’s weather models and ran simulations; it was because of IBM that the University of Michigan succeeded in dodging the storm. This image highlights the strategic merit of the storm-dodging feat on Day 3 in which IBM technology was crucial; the map shows the University of Michigan far ahead of all the teams unfortunate enough to get caught in the storm that it outran. To illustrate why this is the case, consider the Day 3 storm. Without access to such a precise and reliable model, Michigan would have been less equipped to dodge the storm, and may have become caught in it. This would have forced Aurum to slow down and waste time in the clouds, causing it to expend valuable solar energy. All other teams experienced this, which is a large reason why Aurum won by a record 11-hour lead—and as the only car to finish the race solely on solar power. The reach of IBM’s influence extends even further than short-term predictions; another way IBM technology played a hand in creating this 11-hour, purely sun-derived lead was with its long-term predictions. How does it work? It’s similar to the way IBM’s technology facilitates strategic decision-making in the short-term. Yet again, instead of leaving Michigan to sift through a data dump, IBM allows direct access to the most relevant information, harnessing the power of machine learning to combine disparate data sets into one massive model. A cognitive computer takes data from various sources, like other weather prediction models and historical forecasts, and collates them into a coherent whole that provides long-term forecasts. Long-term forecasts are useful when planning hours or even days in advance, and keeps Michigan prepared. For example, the Strategy team uses this long-term forecast when choosing prime charging locations at the end of every day. A good charging location is very open so that when the sun rises or sets at a low angle, nothing blocks the sun rays’ trajectories to the car’s solar array. Minimizing potential shading is key, and that means finding a location with the least amount of clouds and shade as possible, as well as an ideal temperature range—(too hot and the array’s efficiency falls). While Aurum does charge on the move, stationary charging via pointing the array at the sun at the start and end of each day accounts for a significant portion of the car’s total charge. Michigan’s IBM-enabled long-range forecast capability, then, is crucial to overall race strategy. Thanks to IBM’s cutting-edge technology, the University of Michigan Solar Car Team has continued to outperform its competition. IBM’s innovative approach to forecasting taps into the power of cognitive computing and machine learning, which opens a whole new realm of possibility—in both the short and long-term. It is in this realm of possibility that UM Solar now operates. Thank you, IBM. Aurum, the solar car that won the University of Michigan its ninth American Solar Challenge title this year, was designed using Siemens NX CAD and Teamcenter software. Siemens gave us a generous number of licenses to use these products, enough for everyone on the team. This is crucial for team communication and consistency across and between divisions during the build cycle. Siemens NX software is particularly useful when designing solar cars because it allows UM Solar’s aerodynamics engineers to create shapes with G2 continuity. Operating with this higher level of geometric continuity means the team’s Aerodynamic division can avoid sharp corners, making continuous curvature and smoother connections between objects. When the team runs CFD simulations on the car’s design, this gives the Aerodynamic division a more accurate idea of the designed car’s drag coefficient. This is crucial when designing a solar car, because more than typical electric cars, solar cars must be as aerodynamic as possible, since their source of power, the sun, is never a certainty. Aurum was able to win the 2016 ASC because it was better designed than the other cars, because it was more aerodynamic. The 2016 ASC was a solar race characterized by lousy weather, cloudy days and numerous difficult storms; it was rough for any solar car. But Aurum’s overall race time suffered less because its aerodynamic body consumed less power. Siemens NX made such a capable design possible. Siemens NX is sophisticated and offers our engineers a full range of flexibility; they exercise the full extent of their imaginations without having to worry about technology limiting them. Teamcenter also played an important role in Aurum’s design. Teamcenter aids with interaction between different divisions on the team. It allows the Mechanical and Aerodynamics divisions, for example, to work on the solar car simultaneously and to stay up to date with design changes made by one another. When you operate on a crunched timeline and the work of each division relies heavily on the work of the others, it is indispensable to have a system that fosters collaboration and facilitates coordination between these distinct groups that each have different priorities. For the University of Michigan Solar Car team, that system is Teamcenter. A solar race may be won on the road, but it starts on the computer, with a gruelling design period that must be fruitful, because it determines whether the solar car even has a chance on that road. UM Solar’s engineers design more effectively with tools like NX and Teamcenter. Thanks to Siemens, UM Solar continues to put its best foot forward before it even hits the road. Day 8- Michigan Crosses the Finish Line! “We went into Day 8 knowing it was going to be a blackhole of clouds,” 2016 Head Strategist Alan Li says. Solar car Aurum starts Day 8 off by driving at a set speed of 25 miles per hour, and the team knows that number is unlikely to go up on this rainy day. Day 8 is the first time the University of Michigan sees any other solar car on the road—and they all want to pass Aurum. One by one, competitors pass Michigan’s caravan—Dunwoody, Principia, Iowa State, UC Berkeley’s CalSol, Appalachian State—running more aggressive strategies in the hopes that they can win Stage Four. “We don’t budge,” Alan notes. Aurum continues driving at a slow 25 mph. Michigan will stick with its set speed regardless of what the other teams do, regardless of how many cars pass Aurum. UM Solar sticks to the resolution it made last night: the other teams can do whatever they want, Michigan will run its best strategy, will run its own race. As Aurum continues its steady trek towards the finish line, it passes Principia by the side of the road. Principia’s solar car has undervolted; its battery has reached 0%. And since there’s no sun, the car can’t charge. It can’t drive. Principia is now forced to trailer its car to the finish line. Then, Aurum passes Iowa State. CalSol. Toronto. “It was like a graveyard,” Alan describes. Almost every team who didn’t trailer to the Stage Three Finish now sits on the side of the road, undervolted. Sticking to its 25 mph gait, Aurum nears the timing finish line, and from half a mile away, Michigan can see it on the left. On the right, so close to the timing finish line, sits Dunwoody, undervolted. Aurum at last crosses the timing finish line—but it’s not over yet. Aurum still has to make the uphill crawl to the ceremonial finish line at Wind Cave National Park in Hot Springs, South Dakota. Since it’s a hilly trip to Wind Cave, Michigan brings Aurum’s speed down a notch to 15 mph. “Hills are the worst at a low state of charge because going uphill draws more power. When you draw more power, voltage drops. When voltage drops, the battery is more likely to go below the minimum,” Alan illustrates. The team is nervous; there are many large hills between Aurum and its goal. Every time Aurum goes up a hill, its power numbers go up and the car’s state of charges dips dangerously low, bringing Aurum close to undervolting, and everyone in the Chase car holds their breath. Every time Aurum goes downhill, those power numbers go down again as its driver holds the regenerative brake, which essentially takes the kinetic energy of the wheels moving forward as the car slows down and converts that back into energy that can be stored in the battery. If it weren’t so rainy, the risk of undervolting would not be so high. But with virtually no access to the sun, if Aurum were to undervolt now, it wouldn’t be able to start up again. Even Aurum’s slow speed gives reason for worry. Aurum doesn’t have windshield wipers; in place of those, UM Solar uses Rain-X, a hydrophobic coating that aids with visibility in the rain. The faster the car goes, the more effective Rain-X is, the faster the water slides off the windshield. But at a sluggish 15 mph, visibility is tough, and Engineering Director Clayton Dailey has a hard time seeing as he drives the solar car through heavy rain. Earlier in the day, 2016 Business Director Sarah Zoellick broke away from the race route to arrive at the ceremonial finish line ahead of time. 2016 Operations Director Jonathan Cha and Operations Division member Jesse Velleu in the Scout vehicle joined Sarah, and now they wait together for Aurum and the rest of the team’s caravan. Communication is limited because there is no cell service, so the three of them don’t know how Aurum is doing. Based on recent reports, they think that Michigan is still on the road, but they know nothing for sure. As time drags on, other teams’ Weather and Scout vehicles pull in and share tidbits of news: “We undervolted” and “We had to trailer” and “I don’t know what’s going on.” Jon, Jesse, and Sarah wonder if the same fate has befallen Aurum. Did Aurum undervolt? Did Michigan have to trailer, too? In the gray rain, they watch other teams pull in. They are still waiting in this uncertainty when at last they see it: a maize vehicle in the gray. Everyone jumps out of their caravan vehicles and rallies around Aurum as it nears the finish line, running alongside it. Aurum and the team cross the finish line together. Aurum crosses the finish line surrounded by Michigan’s race crew, and everyone cheers and hugs and high-fives. The team breaks into a chorus of the University’s Victors Song, then celebrates some more. And Michigan has much to celebrate: the University of Michigan Solar Car Team has won its ninth overall American Solar Challenge title. The team won with a whopping 11-hour lead on the second place team, breaking the previous record that Michigan itself had set of 10 hours and 19 minutes. Michigan was also the only team in the ASC to finish the race without trailering, the only team to finish the race on solar power alone. Post-finish, the 2016 ASC Race Crew, team advisor Chito Garcia, and longtime friend and supporter of the team Chuck Hutchins pose with the winning car. Michigan has much to celebrate, “But it’s a bittersweet feeling,” Jon says. Jon, like the rest of the team, looks to the future. 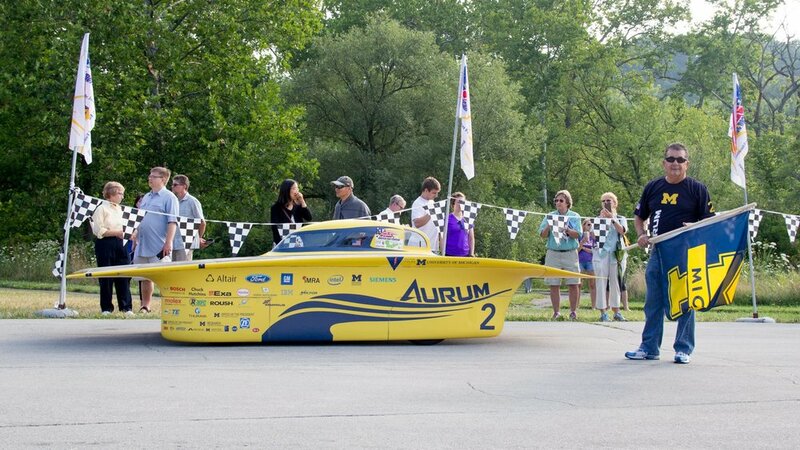 Now that the American Solar Challenge is over, UM Solar will decommission its winning car, Aurum. Come Fall, the team will recruit new members. This new team will work hard, training and designing and testing and fundraising and building the team’s next solar car with a singular goal in mind: to win the 2017 World Solar Challenge. IMRA has been a strong supporter of the University of Michigan Solar Car Team for six years. Aurum, the car that won UM Solar its ninth American Solar Challenge title this past summer, was made possible by IMRA’s support. IMRA’s donations allowed the team to purchase the most integral, most expensive part of the car: a state-of-the art silicon solar array. These solar cells are how Aurum charged its battery pack and fueled its journey to victory. Michigan was the only team competing in the 2016 ASC to finish the race solely on solar power, and Michigan achieved this with the power obtained by the array that IMRA’s contributions helped it obtain. IMRA went beyond even this, helping key members of the team arrange a trip to Japan in 2014, where they met with competitor Tokai University and visited a few Japanese companies. This time in Japan helped Michigan learn more about different manufacturing processes that it would later use during Aurum’s build cycle. Visiting Toray Carbon Magic, for instance, showed Michigan how Tokai built their car’s carbon body. Michigan also forged new connections with companies like Bridgestone and Boeing Japan. IMRA was crucial in making the Japan trip a successful one, not only setting up these connections, but also providing the team with a guide. UM Solar greatly appreciates this support, and looks forward to working with IMRA in the future. Thank you, IMRA. Michigan started Day 6 with a full battery pack, but despite its sunny conditions, the sixth day was taxing; it took Aurum along hilly roads and the cracked rims put stress on the car’s efficiency. To top it all off, Day 6’s End of Day charge was weak. Last night’s charge was not enough to replace a significant portion of the power that Aurum had depleted during the day. The team is concerned. The University of Michigan sets up for Day 7’s Start of Day charge, hoping to gain back some of the charge that was lost on Day 6. But it is a cloudy morning, and the team does not get much charge, leaving Aurum to run on a relatively low battery pack. It is still cloudy at Scott’s Bluff, and the team’s IBM weather model shows 200 W/m^2 of radiation. This is a discouraging, low number; a typical sunny day would mean 1000 W/m^2 of radiation. As the day goes on and other teams pull into the End of Stage location, the cloudiness persists. Most of the other teams also didn’t seen much sun the night before. 2016 Business Director Sarah Zoellick describes how the same conversation seemed to repeat itself as the different teams interacted: “Everyone was saying, ‘We’re really low on charge, this has got to be the most sun-less ASC ever.’” Everyone is looking to that End of Day charge at 6:00 PM. Although it isn’t sunny, all the teams ready for the End of Day charge, setting up their solar cars in the same place. An expanse of tall grass lies between the two gigantic cliffs of Scott’s Bluff, and in this sea of grass is a single grass-less patch of ground. Come 6:00 PM, this patch is covered with solar cars, their arrays all pointing in the same direction and from the same location. And then, with 30 minutes left to go before the end of charge time, the sun bursts out from behind the clouds and the patch of ground erupts with cheers from every team. But the tall blades of grass shade the solar arrays slightly, casting shadows onto them and disrupting their access to the elusive sun. So, members from several teams lay their tents out on top of the grass, trying to flatten the blades and minimize shading. Some people even throw themselves onto the grass. The fit on the grass-less patch of ground is so tight that no one can walk without shading a team’s array, so people get around by crawling instead. “Everyone was fighting for that last charge,” 2016 Operations Director Jonathan Cha explains. The University of Michigan points Aurum’s array as it waits for other teams to arrive at the Stage Finish location. That night, Michigan assesses what weather Aurum could possibly face tomorrow, and how its state of charge numbers could dictate strategy. At 153 miles, Stage Four is the shortest stage, but Aurum does not have much power and the weather models project a cloudy Day 8. The team is concerned, unsure of whether Aurum can finish the race tomorrow on solar power alone or whether the team will have to trailer, as well. UM Solar begins weighing its options. What happens if Michigan has to trailer? The cost of trailering, an addition of 3 minutes per every mile trailered, is steep. What distance should Michigan drive and what distance should it trailer in order to keep its lead? Overall, Michigan had a 10-hour lead on the second place team, Dunwoody, and UM Solar does the math: if Michigan trailers the entire way, how great a penalty will it incur? Can the team still win? No. The Strategy division runs simulations and calls team alumni. The WRF weather model says the team may see some sun at around noon on Day 8, but the team’s meteorologists and the alumni on the call don’t believe that’s a possibility. Strategy runs a simulation with very low radiation numbers, which is more realistic, and puts Aurum at a low set speed of 25 miles per hour. The car would finish in seven hours, but it would finish. By the end of the call, Michigan has resolved not to worry about what other teams are doing. The other teams will run more aggressive races tomorrow, eager for a stage victory and really gunning for it, because Stage Four is their last chance. But Michigan has resolved to run its own race, to drive at the speed that will get Aurum to the finish line on its own power. The University of Michigan leaves Beatrice, Nebraska at a starting speed that is slower than normal; Michigan is winning, so it can afford to adopt a conservative strategy. After all, the drive ahead, moving west across Nebraska, is the most energy-consuming part of the race; the roughly 450-mile-long stretch between Beatrice and the End of Stage 3 location is almost entirely uphill. Soon after leaving, the Strategy team sees more radiation in reality than their models show, so they have Aurum speed up a little, still playing it conservative. But still, Aurum’s power numbers are higher than usual; the solar car is working harder than it should be. Typically, Strategy can tell if anything is wrong with the electrical systems of the solar car by looking at its telemetry data. In the Chase vehicle, however, the telemetry shows nothing suspicious. Engineering Director Clayton Dailey is driving, and similarly, he feels nothing out of the ordinary. Solar car drivers can sense something is wrong when the relays click, if the steering wheel displays any errors, if they hear any abnormal sounds or feel that the car isn’t handling acceleration well—Michigan puts its solar car through enough testing that drivers can tell when things are functioning normally and when something is off. But there seems to be no clear-cut reason why the power numbers are so high. As the 6:00 PM End of Day charge approaches, Aurum’s front right tire pops and Clayton pulls off onto the side of the road as quickly as possible. In about 12-15 minutes, team members complete a speedy tire change to replace the flat—and then, they hear hissing. This is very unexpected; it is a new tire, after all. Everyone is surprised—and they should be. the probability of cracking a rim is extremely low. The team moves on to change the rear right tire as well, and to everyone’s shock and dismay, this one produces a hissing sound, too. The chances of cracking one rim is small enough, but two? Unheard of. The team ran them through all sorts of analysis and checks. The team shifts its gaze forward and moves past its initial concern, concluding that general wear and tear—fatigue—is to blame for the incident. After all, these same rims have already gotten Aurum through thousands of miles—10,000 miles. Michigan takes all of the rims and switches them out for spares, marking the old, damaged ones with red tape. The team goes on to an End of Day location just outside of Alliance, Nebraska. Just as it does before every charging period—Start of Day, End of Day, checkpoint, and Stage stop—the team un-tapes the seams of the car, where 3M 471 vinyl tape holds the upper and lower portions of the car together. Aurum charges. Aurum charges, but it isn’t sunny enough for Aurum to gain back a lot of the power it expended during the day. Michigan is concerned about its charge and the implications that will have on performance tomorrow. The team prepares Aurum for its End of Day charge outside of Alliance, Nebraska. Despite the problem posed by the flat tire and the cracked rims, Michigan is able to get back onto the road fairly quickly; the race crew went through tire change drills before the race, and it has paid off. The University of Michigan’s foresight, preparation, and steady hand under pressure controlled and minimized the impact of the situation, ensuring that it would not end up negatively affecting the remainder of the race. The University of Michigan College of Engineering is an invaluable partner of the Michigan Solar Car Team. Since 2011, the College of Engineering has allowed the team access to the Wilson Student Team Project Center. The Wilson Center is the epicenter of the Solar Car Team; here, the team stores composites, meets to discuss procurement, does battery work, and more—here, we piece the solar car together. It cannot be overlooked that the College also provides the team with most of its talented, dedicated recruits. A team is only as strong as its individual members, and when the majority of these members study at one of the top engineering schools in the world, that strength is formidable. During the 2016 American Solar Challenge, the College of Engineering provided UM Solar with social media coverage. It also wrote articles and put out press releases both before and after the race detailing the team’s work and accomplishments. The team appreciates the marketing value this granted us. The team is very grateful for the College of Engineering’s continued support; without the College of Engineering, the Michigan Solar Car Team would lack workspace, engineers, and extra publicity. Without the College of Engineering, UM Solar would not function so smoothly. Thank you, Michigan Engineering! Stage Three starts out differently. The sun shines as solar car Aurum leaves the Start of Stage location in Wilson’s Creek National Battlefield, Missouri. Aurum in Wilson’s Creek National Battlefield, Missouri. After driving up the western side of Missouri at around 55-60 miles per hour, Aurum arrives at the first checkpoint of Stage 3 in Topeka, Kansas, and begins its 45 minutes of allotted checkpoint charge. Sunny conditions have persisted, and it’s hot, too. 2016 Head Strategist Alan Li describes Driver and Race Mechanical Engineer Andrew Toennis’ shirt drenched in sweat. That’s how hot it is, a far cry from the thunder and lightning of Day 3. At this point in the race, the University of Toronto is the closest team behind Aurum, and the University of Michigan expects to see them in Topeka. But 45 minutes come and go, and no Toronto. Michigan takes stock of the situation: this means that, at best, the nearest team is 45 minutes away. Michigan leaves Topeka and heads towards the second checkpoint of Stage 3 in Beatrice, Nebraska. Alan’s simulations inform him that Michigan can hit Beatrice if it wants to, but the simulations give an estimated time of arrival of 6:10-6:15. This poses a question, because the two-hour-long End of Day charge starts at 6:00 PM; if Michigan were to arrive at the Beatrice checkpoint for its End of Day charge, it would forfeit its 45-minute checkpoint charge and, instead of charging for a total of 2 hours and 45 minutes, Aurum would only charge for two. Going to Beatrice is Option #1, and makes Alan uneasy, because it would mean lost energy: “I don’t like lost energy.” Option #2 was to stop Aurum before the checkpoint and get the two-hour End of Day charge there, then go on to the checkpoint in the morning and charge for 45 minutes there. Option #2 would mean a total of 2 hours and 45 minutes of charging time. Alan chooses Option #2 and Michigan stops one mile outside of Beatrice. But the simulations show that the End of Day charge may get Aurum close to fully charged. Alan says he messed up, that the correct decision would’ve been to go straight to Beatrice, because the next morning, on Day 6, when Aurum pulls into the checkpoint after a 2-hour Start of Day charge as well, it does so with a full battery pack; it can’t store any more energy. But Michigan has to observe the 45 minute checkpoint time and cannot leave before the 45 minutes are up, so the team stays longer than it has to, spending precious time off the road. In the grand scheme of the 2016 American Solar Challenge however, this slip-up did not matter for the University of Michigan. The team took note of and learned from its mistakes, and looked forward to the route ahead. During the Start of Day charge, the University of Michigan sees on-and-off clouds to the East. Eventually, they clear up. Aurum didn’t get the best charge, but it got something, and Strategy’s weather models predict sun the entire day. Aurum drives at about 45 miles per hour for around three hours before pulling in at 11:30 AM to the End of Stage Two location at Republic High School in Republic, Missouri. The weather models had predicted accurately; the sun beats down on the Solar Car Team and the temperature hovers at around 95 degrees Fahrenheit. But the team can’t take advantage of it. When Michigan tries to charge Aurum during its allotted 15 minutes, something goes wrong. The first minute goes smoothly: Michigan manages to empty the car of its driver, point the array towards the sun, and change the battery pack configuration, readying Aurum for charge. But once Aurum begins charging, the race electrical engineers notice that despite the sunny conditions, only about 20 Watts of power come through the array, a far cry from the typical 1000 Watts that they had expected. Effectively, the car cannot charge. The first thing that comes to mind: is there a problem with the Maximum Power Point Trackers? Maximum Power Point Trackers (MPPTs) are responsible for maximizing the array’s production of charging power by maximizing the power output of the solar cells. Using a transformer, MPPTs also match the output voltage from the array to the required input voltage of the battery. The electrical engineers put their heads together and conclude that since the car was not supporting itself on battery power, the battery was most likely the issue, not the MPPTs. Michigan lets officials know about its battery problems and asks if it can work to fix the battery now. But the University of Michigan cannot. In accordance to race regulations, after its 15 minutes are up, Michigan must impound the faulty battery by locking it into a box; this rule prevents any team from cheating by charging their battery more than the competition. Only when the End of Day charge begins at 6:00 PM can the University of Michigan again work on the battery. Michigan forfeits its 15 minute charge and instead focuses its full attention on trying to diagnose in this small amount of time, scrambling to test as much as possible in order to gain a better understanding of the problem. All of the team’s electrical engineers gather around the car with laptops, trying to piece together an idea of what is going on, and moving fast, trying to gather data while they still have the battery to work with. The 15 minutes run out. Now, a new clock starts: the team has five hours to figure out what to do—without touching the battery. The Electrical team joins Head Strategist Alan Li in the Chase vehicle to assess telemetry data in an attempt to pinpoint the origin of the problem. They bounce ideas off of one another and come up with two viable explanations: 1) there is a problem with one of the relays, which open and close circuits, or 2) there is a problem with a fuse. Michigan’s relays are reliable, durable; Electrical concludes that they are not the problem, and that one of the fuses in the battery blew. The race battery has three fuses, one low-voltage, two high. Unfortunately, Electrical is unable to use the telemetry data to divine what caused the faulty fuse to break or even to discern which fuse was the broken one. Looking at the time intervals between the actions taken immediately prior to the problem’s inception, the electrical engineers manage to narrow it down to the two high-voltage fuses. But they don’t know which fuse out of these two is broken. Luckily, Michigan comes prepared; the team brought a second, nearly identical battery pack for testing purposes. Electrical fiddles with different parts of this spare battery to try and recreate the conditions that arose on the race battery pack. One at a time, Electrical removes the fuses, testing to see if one or the other results in a replication of the race pack’s behavior. Removing the positive high-voltage fuse results in the behavior most similar to that of the race pack. Now that the Electrical team has identified the likely root of the charging problem, it methodically choreographs a procedure to replace the fuse as swiftly and seamlessly as possible, dividing up and delegating specific tasks to specific people and rehearsing the repair procedure on the spare battery. Lucas has worked most closely with the race battery in the past, so the team decides he will be the one to actually perform the repair, while others assist him with diagnosis, tool accessibility, and more. Stakes are high. “It’s the kind of thing where if you do it wrong, it’s the end of the race,” Business Director Sarah Zoellick notes. “On top of that, you’re dealing with what is basically a small bomb.” It’s true; if the team messes up badly, the battery will likely catch fire, and could explode. It has the explosive power of roughly twenty hand grenades. While Electrical prepares and plans for 6:00 PM, the Strategy team reckons with the implications of different possible outcomes. The question is whether the Electrical team can get the battery fixed before the End of Day charge time runs out, and how its performance will impact the race going forward. Alan runs simulations assessing three situations. Situation One: Electrical manages to fix the battery very quickly and Aurum gets to charge for almost the full two hours of End of Day charge—End of Day charge is fine and the following Start of Day charge is fine. Situation Two: Electrical doesn’t manage to fix the battery quickly enough for Aurum to take advantage of End of Day charge, but fixes it in time for Start of Day charge the following morning—End of Day charge is compromised, but Start of Day charge is fine. Situation Three: Electrical doesn’t manage to fix the battery until the end of Start of Day charge—End of Day charge is compromised, Start of Day charge is compromised. In the half-hour leading up to the End of Day charge, the remainder of the team readies itself for pointing the array in the event of the best case scenario—Alan’s Situation One. The electrical engineers and driver/Engineering Director Clayton Dailey gather replacement fuses and relays. They lay out toolboxes filled with Vector tools—multi-meters and wrenches and electrical tape and anything else that could come in handy. They call over an official to oversee the repair. They pull up the necessary specifications and schematics, don safety glasses and surgical gloves, and get into their individual designated positions. Michigan is ready. Open toolboxes and spare components surround the University of Michigan’s Electrical team as it prepares to perform the repair. The clock strikes 6:00 PM. An official’s voice: “Three. Two. One. De-impound!” It begins. The electrical engineers open the lock box and take out the race battery. Several gloved hands descend upon it—everyone knows their job. The Electrical team tests the positive high-voltage fuse for continuity and finds none; the circuit is broken, and this is the blown fuse. They were right. Lucas calls for tools and others hand tools to him— “It looked like a surgical operation from TV,” Crew Chief Perry Benson describes. Everyone assisting with the repair is calm, collected, focused. Electrical un-tapes the two ends of the blown fuse, unbolts it from the wires on either side, and removes it. Electrical then replaces it with a new fuse, reconnects everything inside of the battery, tapes everything, seals it all up, closes the battery, tries turning it on to check that the repair is successful—(it is)—and then, plugs the battery back into the car. The car powers up, ready for charge. Done. Eleven minutes and forty-five seconds. The University of Michigan’s Electrical team performs the repair on the faulty battery. Once Aurum is charging, the team relaxes a little. “Every electrical engineer took a moment to breathe again,” Lucas describes. “We were able to relax again now that the car was once again competitive.” Alan’s Situation One—the best case scenario—had played out, and better than anyone could have hoped; Aurum gets a solid hour and fifty minutes of charge. Once again, when faced with extraordinary circumstances, the University of Michigan Solar Car Team proves it has the diligence, the training, and the level-headedness to persevere and come stronger out the other side. Radar is a meteorology tool that relays information about storms, pressure systems, and more. It shows a map overlaid with bright and telling colors; dark green signals light rain, yellow moderate rain, and red heavy rain. At 6:30 AM, when Head Strategist Alan Li and Weatherman Austin McDowell check their radar, they see a red splotch—there’s a serious storm right on top of the team’s location—and a California-sized mass of clouds is fast approaching. As members of the General Crew, they wonder what the Array Crew, which is responsible for charging Aurum via solar array, are thinking given the weather conditions. The race crew wakes up in waves. First to wake up is the Array Crew at 6:00 AM, a group of six people who ready Aurum for Start of Day charge at seven. They are responsible for “pointing”—positioning the array at the sun in order to maximize energy intake. Second is the General Crew at 6:30 AM, the members of the race crew who are neither drivers nor Array Crew members. They help Array while pointing. At 7:00 AM, the last group awakens: the drivers. Crew Chief Perry Benson has to decide whether or not the team will charge Aurum. As Crew Chief, he is responsible for the safety of the car and crew. The general consensus is that Aurum doesn’t need to charge. It would be an unnecessary risk. To charge in such weather would mean working with and exposing circuitry to rain. The team would also run the risk of having hail or heavy winds damage the array. And when the array points instead of lying in its flat position on top of the car, it makes itself vulnerable to buffeting by strong winds. Charging also wouldn’t be worth the time spent, because last night, Aurum topped off the battery pack (charged fully) and because right now, it’s cloudy and rainy; Aurum is unlikely to gain much charge in such conditions, anyway. Perry notes that the team instead shifts its focus onto getting the car ready and as close to the start line as possible. Aurum starts off driving at a moderately slow pace, heading into clouds and rain. The Strategy team sees more radiation in reality than they had expected, so they decide to have the solar car speed up little by little before it at last pulls into checkpoint at Ulysses S. Grant National Historical Site in St. Louis, Missouri. When Aurum heads out again, it drives into scattered clouds and sun-chases until it becomes consistently cloudy. “Sun-chasing” is a strategy that involves driving slower in more sun in order to obtain more energy and faster in less sun in order to get out of the clouds as fast as possible, because the car gains little energy then. As the University of Michigan drives down the eastern side of Missouri at a speed of around 45 miles per hour, approaching an abrupt turn west, the California-sized cloud mass looms closer and radiation keeps dropping. Right before the team reaches the corner where the road turns west, Race Electrical Engineer Michael Toennies turns to show Alan the radar, and it shows something even worse than a red storm—a pink storm; there’s thunder and lightning in that cloud. And it’s heading straight for Aurum. They have to do something. The team is on the edge of the storm. Having run simulations using IBM’s weather model, Strategy thinks that if Aurum increases its speed, the team can dodge this threatening storm. When Aurum hits the turn, it speeds up to 65 miles per hour and drives west at that speed, trying to put as much distance between itself and the severe weather before the storm hits the route. While making the turn, Alan describes looking to the left and seeing nothing but clouds. Only to the right could he see “real sky,” he says. As Michigan drives on under real sky, less fortunate teams remain stuck in the storm’s grasp, which puts Michigan at a great advantage; Michigan is able to drive on without endangering Aurum and while leaving all other teams behind to struggle and slow down, piling more minutes onto their overall elapsed times while unable to get much power. It’s the ultimate strategic situation. This image illustrates the strategic merit of the situation; the map shows the University of Michigan far ahead of all the teams unfortunate enough to get caught in the storm that it dodged. Twenty minutes later, with the storm behind it, the team begins looking for an End of Day location to stop and charge. From the Chase vehicle, Strategy sends a range of possible locations for Weather and Scout to assess. Weather, Scout, and Media head out to scout potential locations. Suddenly, on the radar, two more storms appear out of nowhere. The range of locations Strategy sent is covered by a torrential downpour, so Weather and Scout make the decision to go slightly backwards and find a different End of Day location. Cell service is bad, so communication proves difficult, and Business Director Sarah Zoellick, who drives the Media vehicle, does not hear of the location change in time. She drives exactly five minutes past the new End of Day location and directly into “an out-of-nowhere,” “pitch-black” storm with harsh winds and heavily streaming rain. “It was the kind of thing where cars pull off onto the side of the highway because it’s too much,” Sarah recounts. “The visibility was bad and road conditions were unsafe even for heavy, full-sized cars. If Aurum had gone to the original location, the caravan probably would have had to pull off onto the side of the road.” The team had made a good call when choosing to change the End of Day location. The Weather vehicle finds a location and the team pulls over onto the side of the road. It is raining lightly and the location is not optimal for charging. Team members pull out their phones, searching for better possible locations. Operations Director Jonathan (Jon) Cha and Operations Division member Jesse Velleu drive the Scout vehicle, and they head out to search again. They come across a tiny church just down the road, and the rest of the team follows. The main caravan, the solar car, and the team’s semi take up half the road. Once in the church parking lot, Perry decides they shouldn’t stay here and should move Aurum into the trailer; this is also not a good charging location. A good charging location is very open so that there’s no potential shading of the array and so that when the sun rises or sets at a low angle, nothing blocks the trajectory of light to the array. The church lot is enclosed on three sides, with trees blocking the path of the sun. It would be fine as an End of Day location, because it is so cloudy that Aurum won’t charge much, anyway. But the team takes tomorrow’s Start of Day charge into consideration, too; there’s a chance the weather could be better tomorrow morning, and it would pay to take full advantage of it. Scout heads out again to look for a location, driving straight into a downpour. “We couldn’t see ten feet in front of us,” Jon recalls. “We told them, ‘Aurum, do not go past this point—it’s dangerous.’” Eventually, Jon and Jesse double back and come across a highway overpass beside a cliff, where they can see a river underneath. It’s back down the race route a ways from the team’s current location, but on the opposite side of the river is a location that looks ideal: a parking lot on the water’s edge. It fits the criteria for a prime charging location, and as a bonus, sun reflection off the water would mean additional power. The pair drives around the rest of the small Missouri town of Van Buren (pop. 800), but find no better place. A big parking lot is full, so it isn’t usable. A baseball diamond is in use, and therefore also not usable. Aurum eventually settles in at the riverside location, right on the water, where it actually manages to charge because the clouds have let up a bit. Array Crew sets Aurum up for charge at End of Day location in Van Buren, Missouri. Throughout the entire day, weather tested the University of Michigan at every turn—costing it charge, nearly delaying it like it did the other teams, hindering communication, rendering the End of Day location search more difficult than it had to be—and at every turn, the team passed each test. For twenty-six years now, Ford and the University of Michigan Solar Car Team have shared a close relationship. With Ford’s sponsorship, we won the 2016 American Solar Challenge, contributing not only to our own legacy, but to the legacy of this storied partnership. During the ASC, Ford provided us with four vehicles which made up a principal part of our caravan—Lead, Chase, Scout, and the team advisor’s car. The caravan is important because it provides support for Aurum during the race. Lead travels 500 meters ahead of Aurum, navigating and keeping an eye out for problems ahead. Chase follows closely behind Aurum, monitoring its energy input and output and gauging what the best path forward is. Scout drives 10-15 minutes ahead, looking for potholes and filling them, marking them, moving roadkill and warning the main caravan of upcoming rough road or railroad tracks—anything that might impede Aurum’s ride. Having reliable caravan vehicles to carry out these tasks greatly benefits the team. Another significant contribution by Ford was its granting us access to the Jacobs Wind Tunnel prior to the race. Michigan needed to test Aurum’s aerodynamics because it added a six-inch crush zone in the form of a bump to the car’s right side. This was in compliance with ASC safety regulations for the driver—the car had previously complied with World Solar Challenge regulations, and it had to undergo modifications before racing in the ASC. Although the bump met the rules, it created a dilemma: the team was concerned as to the kind of aerodynamic obstacle the bump posed. At the Jacobs Wind Tunnel, Michigan took full advantage of the facility, conducting several aerodynamic tests. It was able to calculate aerodynamic forces on the car by experimenting with different wind speeds and yaw angles. It gauged turbulence with the introduction of smoke to the tunnel and with the use of tell tails, strings tied to the bump. Thanks to Ford, Michigan had the opportunity to properly diagnose and quantify this aerodynamic hit. This allowed integration of the aerodynamic setback into the team’s strategy models, which meant clearer and more accurate pictures of what should be done throughout the race—it meant more reliable context for our strategists when making decisions. Thank you again, Ford! We’re very grateful to have you as our partner. Start of Day charging begins promptly at 7 am, and by the end of charge time at nine, Aurum’s battery pack is nearly full. The UM team is in a good place. Day 2 is fairly sunny, and based on the weather models, Aurum can drive at the speed limit again. Driving at the speed limit, Aurum reaches the end of Stage 1 at 11:02 am, winning this first stage about two hours ahead of current second place team Principia. Graph (distance traveled over time) showing the University of Michigan pulling to the End of Stage 1 location ahead of competitors. ASC race structure consists of four stages, each punctuated by a number of checkpoints. When a solar car stops at a checkpoint, it gets forty-five minutes to charge before getting back onto the road again. At stage stops, however, the car gets fifteen minutes of charge and then must wait as other teams continue to pull in for the End of Day charge period at six pm, which ends at eight pm. After the Start of Day charge the following day, whichever team is in first overall starts the following stage first. This year, in commemoration of the National Parks Service 2016 Centennial, ASC organizers partnered with the National Parks Service Midwest Region, and all end-of-stage and checkpoint locations were national parks or historic sites, making for a very scenic race through the heart of the nation. Today, the University of Michigan awaits End of Day charging in George Rogers Clark National Historical Park of Vincennes, Indiana. Teams point their arrays, readying for End of Day charge at George Rogers Clark National Historical Park. After winning the FSGP and thus beginning the race in pole position, Michigan has retained its lead, ensuring it will start Stage 2 first tomorrow after the Start of Day charge. The team’s solid performance thus far is encouraging, especially considering the predetermined time penalty it acquired going in. This penalty stemmed from the fact that Aurum was originally designed for the 2015 World Solar Challenge, whose regulations differ from the American Solar Challenge. Some of the changes the team made to the car were not detrimental, like the wiring of additional signal lights. However, the bump protruding from Aurum’s right side meant a six minute penalty on every day of the race. Crew members gather around Aurum, bump in prominent view. The team had to add this bump because ASC safety rules require a six-inch crush zone encircling the driver. The roll cage met impact requirements and Altair’s Hyperworks software confirmed driver safety in the absence of such a crush zone, but despite this, the team still had to add six inches of space to the driver’s right side. This addition worried the team on two counts: aerodynamics and penalization. The bump fulfilled one regulation, but broke another: the car was now too wide. Thus, before even starting the race, Michigan found itself facing a penalty of six minutes added onto every day—a deficit of 48 minutes over the course of the entire race. The bump cost the team elsewhere, too. It made the car less aerodynamic. The penalties were minutes, but a serious problem in aero could cost Michigan hours. Support from Ford allowed Michigan testing time at Jacobs Wind Tunnel prior to the race, which enabled the team to quantify the aerodynamic hit caused by the bump. This translation to tangible numbers allowed the team to incorporate this aerodynamic setback into its strategy models. Aurum undergoes aerodynamic tests. Tell tails stick out from its side. Day 1- The Race Begins! "Weather is a fickle thing." That’s what Head Strategist Alan Li tells me when I ask him about the 2016 American Solar Challenge. Weather is a fickle thing, and when your race strategy hinges upon weather, you must get comfortable with the ambiguity. The morning of Day 1, Alan runs simulations on both the WRF and IBM models, trying to gauge the weather outlook for the day and decide on a strategy. Alan notes that since Aurum won the FSGP and is thus the first seed for the day, they could always go the speed of the second-seeded team behind them once they start. This would offer Michigan an opportunity to gauge its position relative to its opponents while assuring it will stay ahead of them, because each team leaves one minute after the team ahead of them in the FSGP-determined line-up. However, the strategy team decides this is not the optimal choice to make, and keeps it as a fallback plan. Alan considers two possible approaches. He can go the more aggressive route—use more energy now and hope the weather will get better—or he can go the more conservative route—drive slower and save energy for later knowing that it will be cloudy. Alan decides on something in between these two extremes, not wanting to burn out, but not wanting to fall behind, either. Fog hangs low over sleek solar car aerobodies and sticks to skin. Jokes fly around about what oh-so-wonderful weather this is for solar racing. No one’s too worried, though, because all teams start with a full battery pack. As the team prepares for race start at eight, the air fills with excitement; this is the first solar race for most of the 2016 ASC race crew, and this feeling is like no other. Team alumni and family members join the team at the starting line, there to support and cheer on Aurum and the people behind it. Tradition dictates that longtime friend and sponsor to the team Chuck Hutchins run over the starting line beside the car with a University of Michigan flag in hand, but Chuck couldn’t make it this time. And so, when the clock strikes eight, longtime friend and advisor to the team Chito Garcia runs with the flag for the first time, accompanying Aurum as its maize and blue rolls past the black and white of the starting line—the race has begun! Chito Garcia stands beside Aurum, ready with flag in hand for race start. As the race progresses, the team keeps its eye on the weather. The strategists sit in the Chase vehicle, looking at the large Intel monitor mounted to the back of the front seat. On its screen, the WRF model shows about 200 watts per meters squared less radiation than there actually is, as measured by the pyranometers provided to the team by Apogee Electronics and PP Systems. Pyranometers measure solar irradiance and solar radiation flux density, which allows the team to assess real time solar conditions. Given the 200 w/m^2 discrepancy, Alan thinks Aurum should be going faster. The decision the team faces now: will this 200 w/m^2 difference stay the whole day, or will it disappear? Alan consults his weatherman, Austin McDowell, to see if he thinks the weather will get any better, and together they decide that the bad weather is either going to persist or get even worse. Upon deciding the 200 w/m^2 difference is here to stay, the team decides to push the set speed up to the speed limit, and Aurum arrives at the first checkpoint, the Dayton Aviation Heritage National Historical Park in Dayton, Ohio. The team charges Aurum for the designated forty-five minutes before hitting the road again, catching sight of another team as the car leaves. Clouds no longer splotch the sky, and in accordance to what the models say, Aurum drives the speed limit for the rest of the day before settling in at six pm for its End of Day charge. Aurum gets some rest. The team gets some rest. Tomorrow, it continues. Race crew vaults over the track barrier in preparation for a pit stop. How is the suspension? The battery safety? How are the tires? Can the primary driver exit the car in under ten seconds? Are the turn signals bright enough? Three days before the start of the racetrack qualifying stage, scrutineering opens, a strict process that involves officials checking various aspects of the car to see that it meets race and safety regulations. Race officials inspect brake efficacy, structural stability, driver vision, the solar array, mobility, and more. They set out to determine the car’s readiness for a race stretching 1,975 miles of highway—highway filled with stressful uphills, speckled with potholes, crisscrossed by train tracks, and punctuated by unpredictable weather. Driver Andrew Toennies exits car in 4.95 seconds during scrutineering. The University of Michigan Solar Car Team passes these inspections with flying colors, finishing scrutineering first. This distinction awards Michigan the advantage of starting the qualifying race from pole position. The three-day qualifying race for the ASC, the Formula Sun Grand Prix, or FSGP, was held at the Pittsburgh International Race Complex. In the same way that the winner of scrutineering starts qualifying in pole position, the winner of the FSGP starts the ASC in pole position. This is a huge advantage, because it means not needing to pass other teams’ entire caravans—their solar cars, lead vehicles, chase vehicles—while mid-race. The FSGP is straightforward: over the course of three days, teams compete to complete as many laps around the track as possible. The FSGP proves to be the first test of how teams perform in weather; the third day, it starts raining. All teams concern themselves with slickness and ensuring they have enough energy to continue. Some teams struggle, stalling when going up hills. Out of the twenty teams that undergo scrutineering and enter the FSGP, twelve succeed in qualifying. For Michigan, everything—down to pit stop turnover—runs smoothly. Michigan wins the FSGP with 518 laps—828 miles—and the team shifts its focus to the next task: in thirty-six hours, the starting gun will go off in Brecksville, Ohio, and the ASC will begin. The night before the race begins, strategists Alan Li, Michael Katz and Leda Daehler, meteorologists Austin McDowell and Jeffrey Cwagenberg, and Engineering Director and driver Clayton Dailey analyze the expected weather for tomorrow. Together they set out to formulate an idea of Day 1 race circumstances in order to brainstorm a game plan. But the two models say different things. Meteorologists always look at many different sources, and across all the other different sources they consult, the trend persists: conflicting predictions. Staring down the barrel of the start of the race and uncertain weather, the team heads to bed. For the sixth consecutive time—and for the ninth time overall—we won the 2016 American Solar Challenge. Despite difficult conditions, we finished a record 11 hours ahead of the second place team, and were the only team to finish on solar power alone. The following series of posts will reflect on the race and recognize some of the sponsors that make our accomplishments possible. It has been 642 days since the 2013 World Solar Challenge came to a close. Despite a devastating crash during the race, our team still managed to pull of a top-ten finish after spending all night repairing Generation, our team's 12th vehicle. From the day the race ended, our team has been hard at work to bring the world something better. Something faster. Something that breaks down all the records that have been set already. We are excited to show the world what have made possible. This morning, we unveiled our team's 13th vehicle, Aurum. With a sleek new aerobody, and top knotch electrical and mechanical systems, Aurum is the ultimate electric vehicle. An asymmetrical catamaran body designed by the team's Aerodynamics Division is projected to be more aerodynamic than any vehicle that our team has ever produced, including three-wheel designs, and designs allowing the driver to be in a much more laid-down position. The power losses from the electrical system has been minimized through innovative design. The mechanical systems have been optimized for weight reduction and an increase in overall strength and reliability. Every aspect of our designs have gone through countless iterations to produce this icon of sustainable engineering. Green energy is the future, and although our design is still far from the average electric vehicle, it is one step closer to becoming your daily ride. A change in the regulations for the 2015 Bridgestone World Solar Challenge requires the charging of the vehicle to not use any external stands, and our new car incorporates a charging stand into the body of the vehicle that can be adjusted for finding the optimal charging angle. Another major change in design is more visually apparent in the car's race configuration. On the drivers side, the body of the car follows the lines of the driver's shoulder, and blends the chassis and the lower body's shape together to form the outside wall. The canopy's smooth lines are dictated in size by a carbon fiber roll cage inside that protects the driver from impact, and allows us to minimize the height from not needing additional area that a metal roll cage would take up. The main airfoil's thickness is slimmer than ever before. The next step is to prove Aurum's capabilities at the World Solar Challenge. We have built a car, and we are building a team that will be ready to win the world. We are just over 3 months out from the start of the race, and there is still much work to be done, but we wouldn't be the University of Michigan Solar Car Team if we weren't up for the challenge. Stay connected with the team via Facebook, Twitter, and umsolar.com.